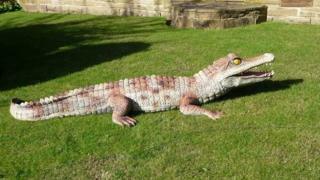 An ornamental crocodile that has delighted passers-by for a decade has been stolen from a garden in a Leeds suburb. The 6ft (2m) long resin statue was stolen in Horsforth on Tuesday night. Community group Newlay Conservation Society said: "Whoever it was who did this planned this meticulously. It's a cruel blow to the owners and to Newlay." Police said all that was left was "a perfect splatter of Mr Crocodile". It is thought thieves used bolt-cutters to remove the statue that has been chained down for about a decade. It was a present for Pauline and John Brinn from their son and daughter. Mr Brinn said: "I would like the person who's stolen it, if they have a conscience at all, to bring it back and return it and keep everybody happy." The society appealed on Facebook for people to look out for the crocodile. 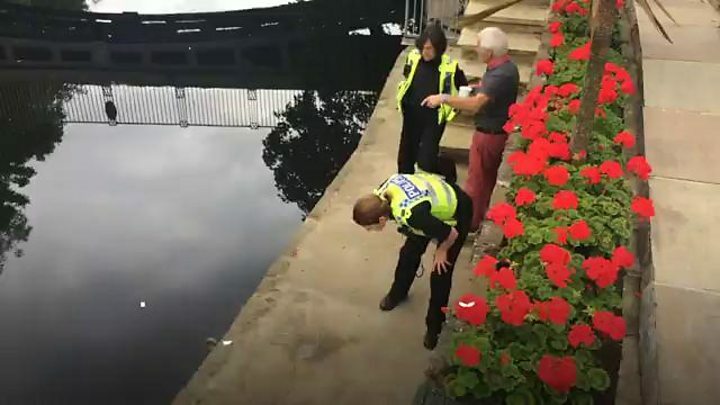 PC Jolene French, of West Yorkshire Police, said: "The community would certainly like to get the crocodile back in one piece and find out who's done it. "All that's left is an imprint into the concrete, a perfect splatter of Mr Crocodile." Newlay Conservation Society said the community was "upset by the theft of an old friend from a house by the river". It added: "Thieves entered the garden of the house next door, bolt-cut a locked gate and then bolt-cut the steel cable securing the croc in place."